Shouldn't there be two releases for this? The original black 3x press from Oct 2017 and the 500 repress in Feb 2018? Good sounding record but for me, the use of sub-bass on every song is highly annoying after a coupe of listens and doesn't add anything to the tracks to be honest. And if you are a fan of using headphones (especially the more expensive types that really bring out the bass) it can get annoying quick after the first track 30 minute track (note: (on a home stereo it's no where near as annoying, which is probably the only way to listen to this record). It's unfortunate as the tracks on here are actually *really good*. But whoever made the decision to have the sub-bass on every song, *throughout* the entire track and not in occasional spots should get slapped as it ruined a potentially 5 star record. At least this wasn't the case on Green Graves...let's hope he drops the heavy use of sub-bass for the next record. I had to hunt for this one, but what an incredible record. A1 is the journey. Which is the greatest Dominick Fernow project? Prurient is his biggest, followed by Vatican Shadow. But actually, it's always been Rainforest Spiritual Enslavement. 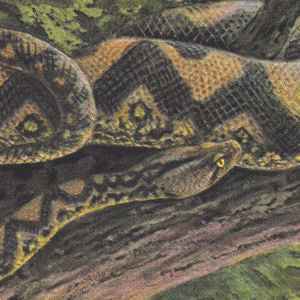 The dubby subbass on this album slithers beneath the industrial pads and ambient melodies like the snake on its cover. Dank yet lush, this is arguably the best dub album of the year. I am looking forward to it. The usual procedure that I would recommend for rarer titles like this one is to place an order locally, which not only offers benefits in regards to indirect access to labels and suppliers, but better payment options too. Am i right, that the Substance Remix is meant to be played at 45 and the rest at 33? Thinking about the cd Version too, for the uninterrupted flow of this magic. The yellow vinyl sounds great, but i agree - leave colours aside, this is a wonderful album! Flippers and color vs. black debates aside, this is a mind-blowing album and a pretty solid pressing. One of the highlights of the year alongside Wanderwelle's Lost in a Sea of Trees.